We're delighted and honoured to announce that Saffron Lounge has won "Time Out Doha Award, 2017". The Time Out Awards, as they're known, recognize the Highly Commended Indian restaurant in Doha. Time Out's annual celebration of the best restaurants in Doha is upon us. Saffron lounge by Vineet creates history and sets the benchmark by winning consecutively 5 times in a row (2011, 2012, 2013, 2014 & 2015) for the best Indian restaurant by time out, Doha, Qatar. Saffron Lounge has once again proved its excellence by bagging the Trip Advisor ‘Certificate of Excellence’ 2015. Saffron Lounge is proud to share the award received from Trip Advisor with a Certificate of Excellence for 2013. We have won it again!!! Saffron Lounge received 2013 Time Out Doha Award. Once again, Saffron Longue has been awarded with the prestigious 2012 Time Out Doha Award. 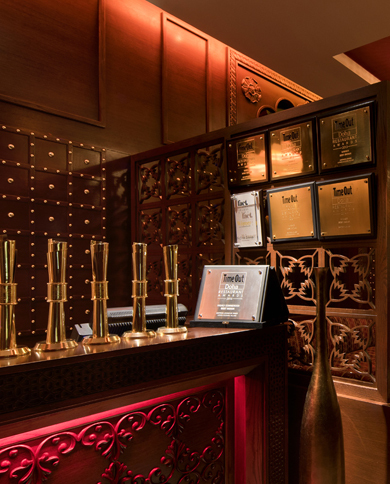 Saffron Lounge received the 2011 Time Out Doha Award. This award recognises city's best restaurant based on quality of food, service, setting, atmosphere and value for money. © 2017 saffronlounge. All rights reserved.